Are you ready for a world tour? Within these pages you can watch a Chinese New Year dragon dance, go snowboarding at Mountain High in California, experience Christmas in the Philippines, spend money on fun in a video game center in Odaiba, Japan; catch shrimp in Australia, and play soccer at Sacramento’s Don Nottoli Park. Step into the Amazon rainforest to hear a croaking frog as loud as a car engine and onto the streets of Taiwan to be serenaded by a putrid-smelling trash truck that plays Beethoven’s “Für Elise”. You’ll have the opportunity to sample such delicacies as spiky giant crabs, milk tea, tiramisu, spicy curry, dried squid, and fizzy melon soda. Here you can visit a garden to meet zombie-fighting plants and see for yourself how war can be like a broken ATM. Take a break by an icy lake that reflects the stars’ smiles like a sheet of glass. While you’re waiting for the morning sun, wrap yourself in the night, the most beautiful blanket in the world; but don’t let your dad’s raucous snoring ruin your sleep. Finally, beware of insubordinate monkeys, the horrors that lurk in a messy desk, and that house-crushing hailstorm. 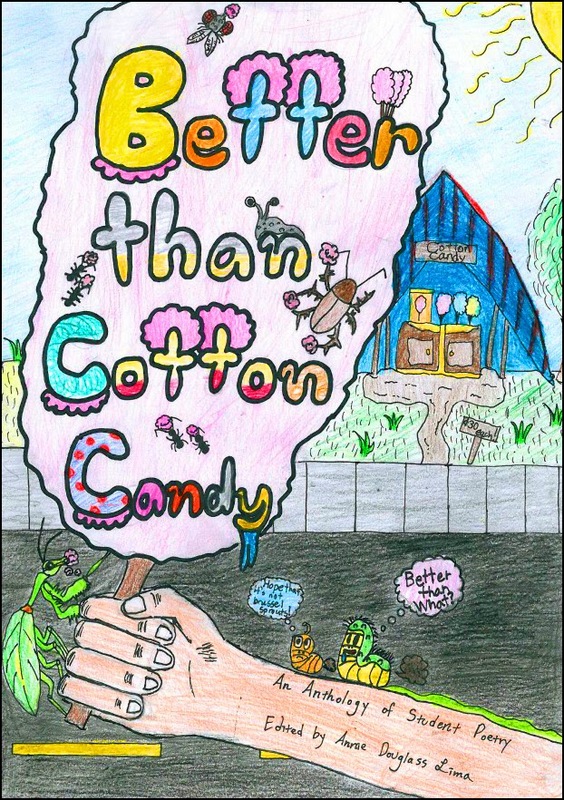 See the journey through to the end and you’ll discover the one substance on earth that is better than cotton candy! Proceeds from the sale of Better than Cotton Candy will benefit Taiwan Sunshine, a nonprofit organization that provides support and encouragement for families of disabled children in Taiwan. Learn more at http://taiwansunshine.org. Click here to buy Better than Cotton Candy on Amazon. Take a look at A Boom in the Room, Sunshine Leaking, Down the Water Slide, or What's That Noise?, more anthologies of student poetry edited by Annie Douglass Lima.